For the past month I have been reading Last Child in the Woods by Richard Louv. 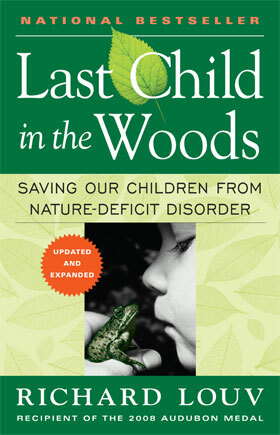 This book has been an eye-opening look into the lack of exposure to nature for our American children and the ill effects that it is having upon our society. Richard coins the phrase, Nature Deficit Disorder and says that the majority of our wired young generation suffers from it. In fact most children are unable to identify 6 species of trees in their own community. This lack of nature is causing an increased epidemic with attention disorders, depression, anxiety and of course obesity. Richard Louv says that technology is not the only thing to blame for this new disorder of our youth. He also places blame on the abundance of organized activities and a new fear of nature that children absorb from parents, school and the media. Years ago, children spent the majority of their free time outdoors. They’d play with neighborhood friends, explore their local woods and streams and not be expected to be back until dinner time. It was during this time that parental warnings were about staying away from poisonous berries, poison ivy and when I was a child “strangers”….but that was about it. Today’s child are lured to be indoors more. There are hundred’s of television channels, video games, computers, ipads and so many technological options for them. Today’s child is also over scheduled and has limited free time. Between school, sports, clubs and organized play dates there is very little time to just play. This book has started a lot of discussions with other mothers and my husband and I have quickly realized that my children are not getting the nature exposure that they need (or deserve). I make it a point to not over schedule my children and do limit their technology but my fears of lyme disease and the fact that we live on a busy street has created a fear in me, which I have now transferred onto my children. The only place that I really let them run free and be “nature loving kids” is at our family’s home on a lake. Here I allow my five-year old a great deal of freedom to play, explore and soak up all of the wonder of our great planet.